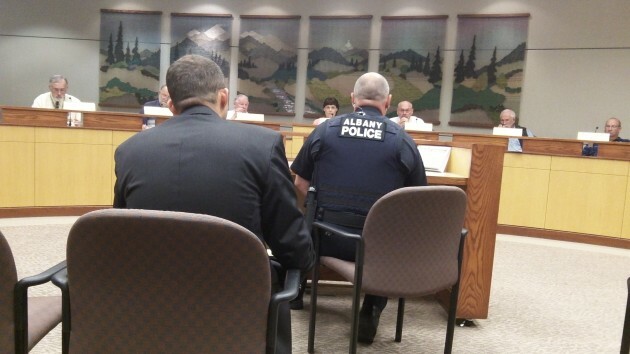 The awkward seating arrangement for people (here, Police Chief Mario Lattanzio, left, and Det. 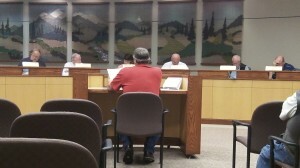 Steve Dorn) addressing the council. From someone who has attended city council meetings in Oregon for close a half a century — 47 years to be exact — here’s a free redecorating tip for the council chambers at Albany’s City Hall: Get rid of that pulpit-like contraption with room for one seat from which people are expected to address the council when they have something to say. As the photo illustrates, the desk for witnesses is designed for one person. A long table with chairs would work better because it would avoid the awkward changing of places when there’s more than one speaker. What happens now is that one person sits down in front of the microphone. The next one has to wait on deck, and if the council has a question of the second one, the first one has to get up to relinquish the mike. If there was a table with three or four chairs and microphones, that many people could appear together, and the council could hear from and question them in turn without all that shuffling of chairs and people getting up and down. At the Capitol in Salem, that’s how witnesses appear before legislative committees — in panels of three at a time. It’s efficient and saves time. Albany’s council dais and witness desk or podium have not been altered since City Hall was built about 20 years ago. Both could have been done better. Why, for example, the little barricade across the council table that hides most of the councilors from the audience? Sometimes all you can see is the tops of their heads. Craig Ziegenhagel left this reply on Facebook: “How about some armless chairs too ! Notice the officer due to the width of his duty belt cannot sit into the chair…some of us rotund people have the same issues ! I would also get rid of that counter/barrier/blockade that the council sits behind. It makes them look like they are on a throne…separated from the public.